Babala is a fun and fanciful game suitable for all ages. 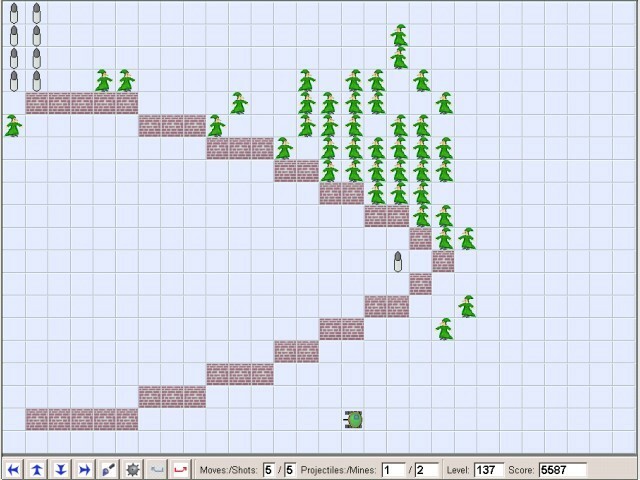 You fend off the enemy muggers (they can't shoot) on a basic grid, amid obstacles and booby traps. The game's defining features are mercifully simple but don't be fooled, because it gets tough as nails to beat as the levels progress. It's all in the campaign designs. A worthwhile scoring system is employed and record high scores can be uploaded for display at Babala.org. There are 200 discrete levels, the first 10 being a tutorial. Gameplay is strictly at your own pace, it's never a test of reflexes. This is a simple Logic/Strategy round-based war game of sorts, not lacking in cute animations. The enemy are arrayed on the field; intently, they dog your every turn. You'll have only limited moves and shots to deploy during your each round, 6 or 7 tops: choose as you go from a set of 5 maximal trade-offs. Your shots are either projectile or mine, assuming you're so armed. Following your strokes, the enemy makes a measured advance. If he reaches you, you're mugged, you lose. There may be obstructions and certain rigged perils, critically situated, or remote ammunition stores that have to be acquired. Must be played to be appreciated: prodigious, often diabolical, never a shortage of variety and the unexpected. And there seems always a way to best an earlier score when you ambitiously replay a level. In-game help is in English, Czech or German, as specified during installation. If not already present, requires download and install of free GTK+2 libraries (3.5 MB) for Windows. There's a Linux version as well, visit www.babala.org.